It’s time to order our wedding bands. I know, I should have done this a long time ago, but here we are. My cousin Dom is a jewelry engraver in New York City and he offered to engrave both of my rings and Keith’s. On Friday I made my way to his shop on 5th Avenue with my engagement ring and no idea what I wanted to write in it. I was going to go with just Keith’s initials, but then decided to add mine. Dom suggested I add the date or our engagement, too. Thirty minutes later I was looking through one of those telescopes things at a beautiful script that read, “EJD & KLB 1-14-10”. You can't really see the inscription. But it's right there. 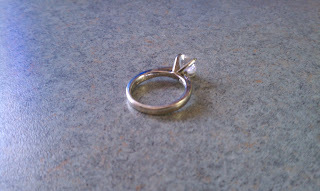 Dom did it on the top if the ring in case I ever get it sized. Dom then introduced me to the jeweler he works with and we planned to meet this month to order the wedding bands. He said he’d have them for us in a four weeks, so that was a huge relief. I was afraid we were going to exchange two Silly Bands at our ceremony! Anyway, my dad gave me my grandmother’s wedding band so I’m going to reset the diamonds from that. Dom said he can engrave our wedding bands with anything we want. If it’s something long, like a line from a song, he can use the first letter of every word. There is one quote that I really like, but I’m not sure if I can shorten it to fit on the ring. So I’ve got to think about it a little bit more. I’m excited to have a personal mark on our wedding bands that someday our grandchildren will store in their jewelry boxes or wear themselves. Hopefully they won’t bring them to Cash for Gold! Tell me readers, do you have your wedding bands engraved? What about your engagement ring? What did you choose to write in them? Please share!